Reducing the pollution depends on every person preventing harmful natural or chemical substances from entering the drains. St. Johns County is responsible for controlling and maintaining its municipal stormwater system. However, it is everyone’s responsibility to reduce the amount of trash and pollution that is carried into the drains. Local taxpayers have to foot the bill for cleaning out the municipal stormwater system, and it is much more cost-effective to stop the problem at the top of the pipe than further downstream. Some people are quick to complain about water pollution, especially when it affects their favorite river, lake, or beach. They may not realize that they may be contributing to this pollution when they pour harmful materials down the drain or carelessly drop litter on the road. The reality is that we all have an impact on stormwater quality, and we can all take steps to make a difference. You could make a difference just by changing the way you do something, like washing your car or walking your dog. Activities which seem harmless or insignificant on a small scale can have an enormous cumulative impact on our waterways. Imagine thousands of people in the streets around you dropping cigarette butts from their cars, sweeping dirt off their driveways or washing detergent off their cars down the street drains. It all ends up in the water. Car washing on the street or driveway: using detergent and allowing it to run down the street drain. Fixing your car on the street: letting used oil or other automotive fluids such as antifreeze, transmission and brake fluid flow into the street drain. Disposing of garden waste: dumping or blowing grass clippings, leaves and other yard waste into the street where they can get washed into ditches, canals, or other storm drains. Hosing the driveway or sidewalk: letting the water carry dirt, soil or other waste into the street drains. Restaurants: not cleaning the grease trap regularly. Motor vehicle repairers or printers: allowing oil, chemicals or other waste to flow into the street drain. Builders: not shielding street drains from spilled chemicals, or excess soil, sand, gravel, or other building waste. All work places: allowing cigarette butts or litter to fall into gutters or on driveways; allowing chemicals, detergents or other harmful fluids to run directly into unshielded street drains. You are the most important part of the St. Johns County recycling program. Consider that the average household generates about 30 pounds of recyclable material every month. So two typical neighborhoods with about 30 houses each produce a ton of material every month that should be recycled. Multiply that one ton by every two neighborhoods in St. Johns County, and it is easy to see how quickly the savings accumulate. You are the cornerstone of our recycling program’s success. Your participation in recycling starting right here in St. Johns County and has a positive impact on pollution prevention to stormwater. By recycling you are eliminating waste that could enter into our surface water. The more items a household recycles, the less waste we discharge into our storm sewers. For more information, please visit the Solid Waste Management Department. Herbicides and pesticides are used to control unwanted or nuisance insects and plants. 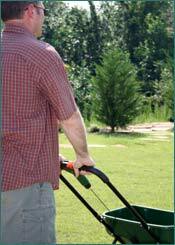 Fertilizers are used to make our lawn and garden grow. Excessive or careless use of these materials results in them being washed by stormwater runoff into our lakes, streams, and estuaries where they cause undesirable results. When using these materials the best practice is to use the least toxic chemical that will do the job. And always follow the label instructions. To find more about the proper use of herbicides, pesticides, and fertilizers, as well as other information about maintaining your yard, please visit the Florida Yards and Neighborhoods site. Proper disposal of motor oil is also very helpful in keeping unwanted discharges out of our storm sewers. For collection locations where used motor oil can be dropped off please contact the Solid Waste Management Department at (904) 824-9720.